Crème Brûlée is typically made by baking individual dishes of custard inside a water bath in the oven. It’s smooth and silky, rich, and full of wonderful vanilla flavor— perfect for a special occasion! 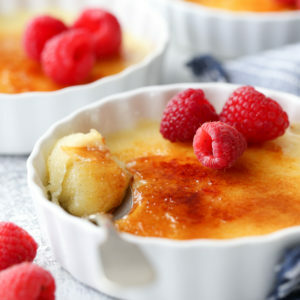 I love crème brûlée as much as the next gal, but even I don’t want to put in all that effort. I’ll leave that to fancy restaurants and pastry chefs. Me? I’m sticking with this super easy, no-bake version. It’s deliciously indulgent and done in half the time! 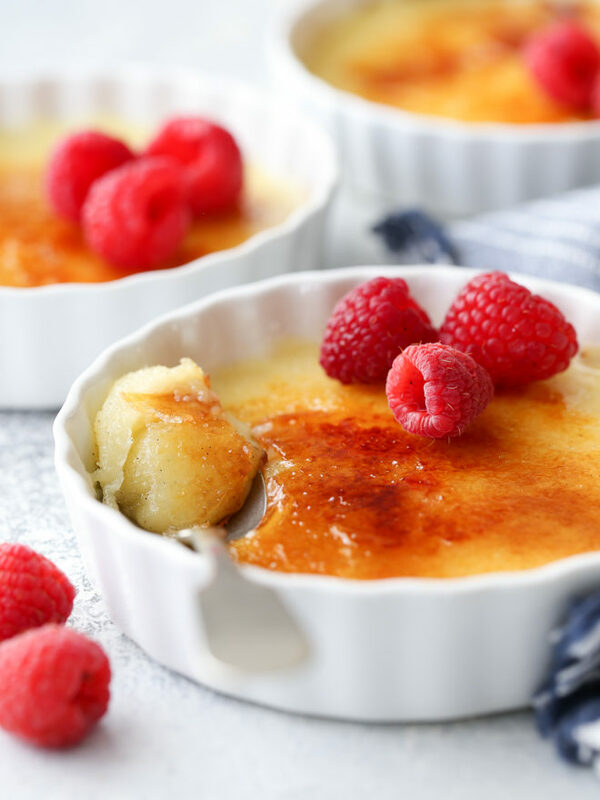 How do you make no-bake crème brûlée? The main difference between this and the real thing is I’ve added extra thickener (both cornstarch and egg yolks) so that it won’t require baking to set the custard. 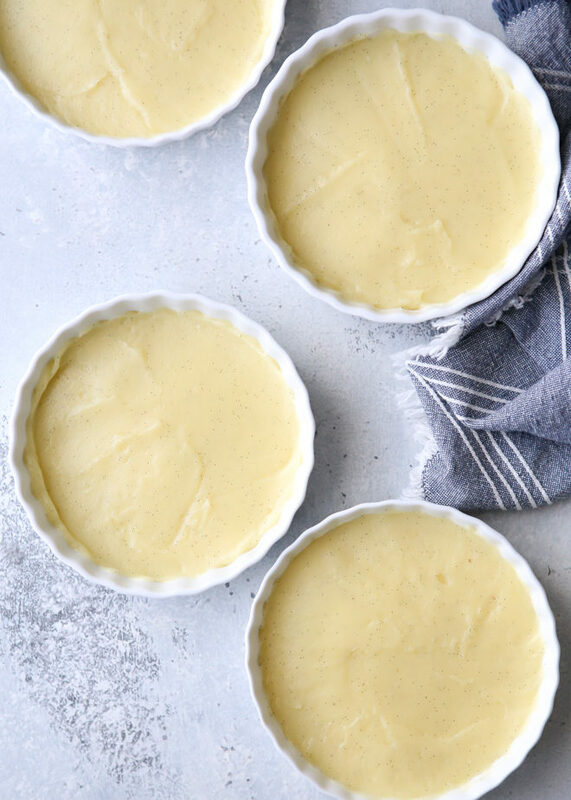 It’s basically vanilla pudding, but once chilled and topped with its signature brûléed lid, you won’t be able to tell the difference! It’s rich, thick, and super creamy. 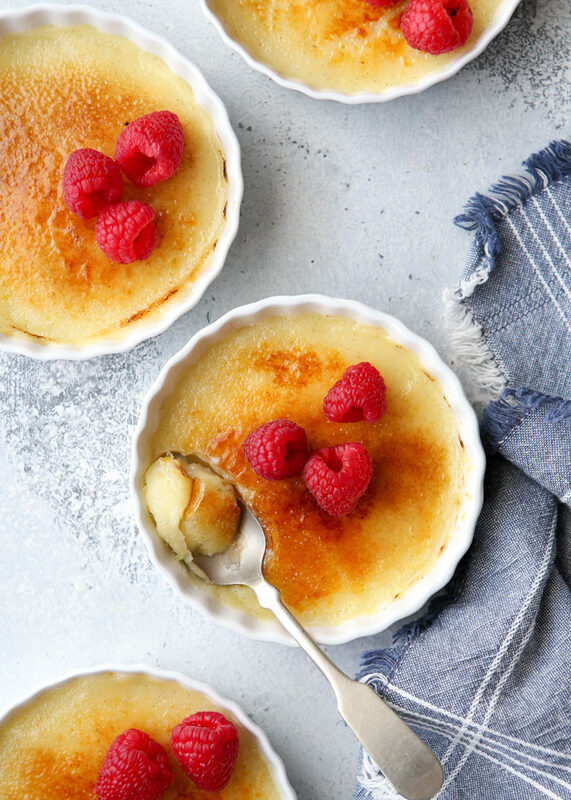 If you never thought you could make crème brûlée at home, I hope this recipe will change your mind. If you can separate eggs and stand at the stove and stir a pot, you can make this recipe! You can use either a kitchen torch  or your oven broiler to caramelize, but the kitchen torch will produce the best results. Kitchen Torch— Cover the surface of the chilled custard generously with granulated sugar. Pass a kitchen torch back and forth over the sugar until it melts and caramelizes. Broiler— Place the oven rack on the highest setting. Put the ramekins directly under the broiler and set it in the “high setting”. Wait for the sugar to melt and caramelize, rotating the ramekins as necessary for even browning. This can take up to 5 minutes. In a medium saucepan, combine the cream, milk and sugar. Use a sharp knife to scrape the vanilla beans from the pod and add to the saucepan. Place over medium heat and stir to dissolve the sugar. Heat just until bubbles appear at the edges and mixture is steaming (do not bring to a boil). 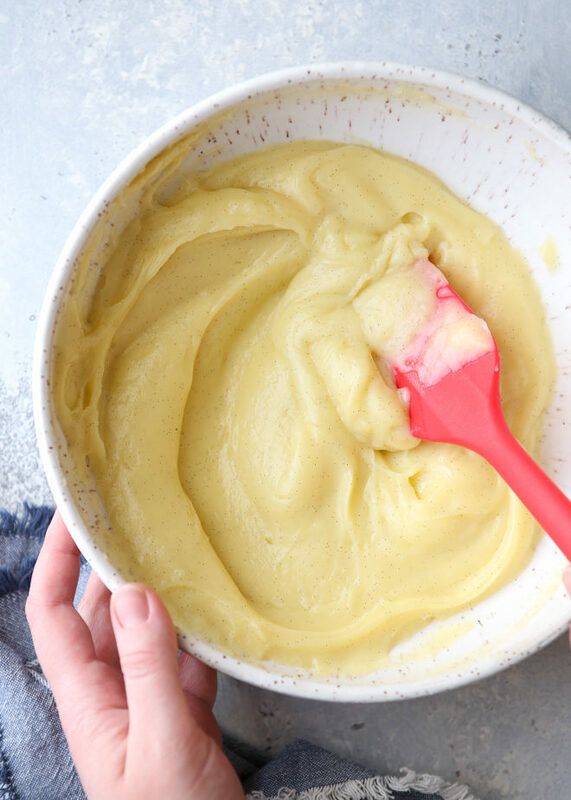 Meanwhile, whisk together the egg yolks and cornstarch in a medium bowl. Add the hot cream mixture in a slow steady stream while whisking constantly. Pour mixture back into the saucepan and return to medium heat. Cook, stirring constantly with a spatula to scrape the bottom, until mixture is thickened. This will take 3-5 minutes. Once thickened, cook for an additional 1 minute, while continuing to stir. Remove from heat and pass custard through a mesh strainer to remove any lumps. Spoon into individual ramekins . Place in the fridge, uncovered, to set up for at least 2 hours. When ready to serve, sprinkle ramekins generously with granulated sugar. Working with one at a time, pass a kitchen torch  over the surface until sugar melts and caramelizes. Serve immediately. 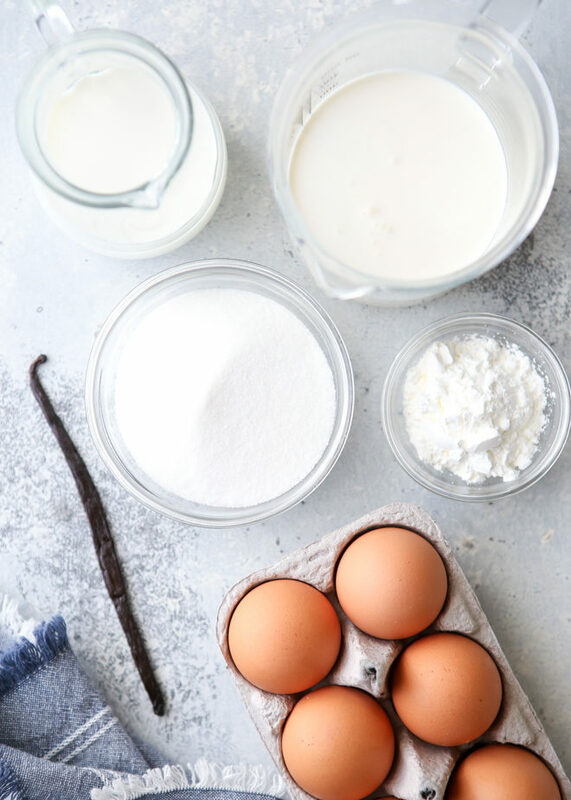 You may substitute 1 tablespoon vanilla extract for the vanilla bean. After the custard has thickened, remove from the heat and stir in the vanilla before passing through a mesh strainer. Can be made up to 24 hours in advance. Brûlée topping just before serving. Recipe inspired by Serious Eats .